As many of you know, this past Saturday the 23rd, GPA had a booth at the Atlanta Science Festival. The entire festival had over 20,000 people in attendance. 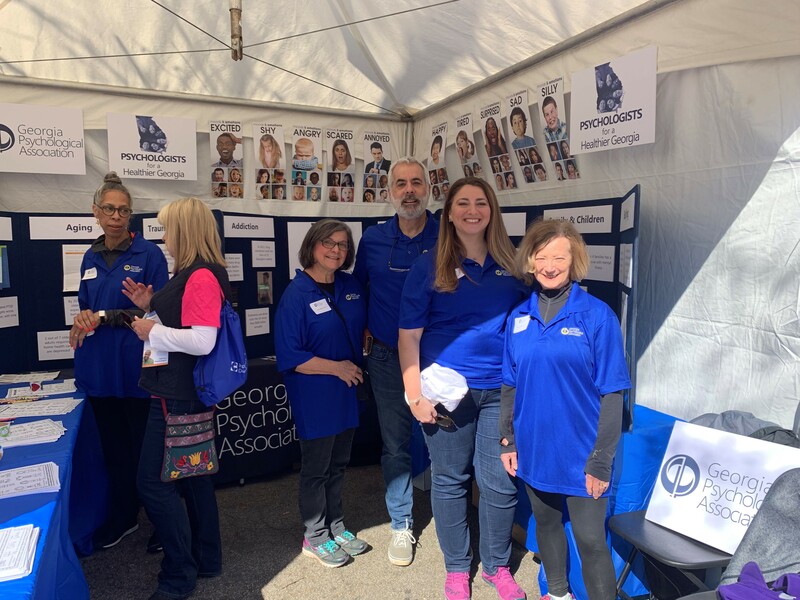 The GPA booth was a big success, and we had thousands of people come through our booth and learn about what psychologists do. We had an activity for children where they selected a cartoon that expressed how they were feeling. They then used crayons to color the picture. We were pleasantly surprised that the cartoons were not just for young children, but teens and adults participated as well. Virtually everyone walked away with a card or sticker with the GPA web site address to assist the people in searching for a psychologist. Participation in such a festival doesn’t happen without the support of GPA members who spent their Saturday working the booth and educating the public. I would like to thank the following GPA members who did a great job representing the profession of psychology: Dora Soublis, Ph.D. (who originally suggested the Atlanta Science Festival), Shital Gaitonde, Ph.D., Heather Hopper, Ph.D., Jennifer Smith, Psy.D., Eileen Cooley, Ph.D., Laura Dilly, Ph.D., Anita Brown, Ph.D., Nancy Weisman, Ph.D., Kamieka Gabriel, Ph.D., Anita Grover, Psy.D. and a special shout out to Gloria Meaux, Ph.D. who had so much enthusiasm it was palpable. Also, I would like to thank my wife, Judy Drutman for helping me set up the display boards, load and unload the truck, and put up with my chronic complaining that it is hard to motivate psychologists to participate in GPA activities! All of the GPA members in attendance agreed that this activity should become a yearly event for GPA. It is a beautiful venue to showcase what psychologists do. I look forward to seeing you join us next year working the booth and schmoozing with the public!